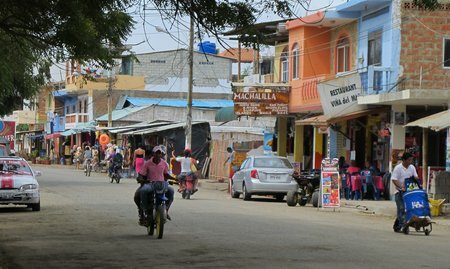 This is a street-side view of the waterfront in Puerto Lopez. Although there are stores along the street, there are also plenty of street sellers, usually on bicycles, who work along this street. From a distance, we thought this guy was selling bread rolls but on closer inspection, it turned out he had a box of various treats and pastries for sale. Guess who had happy kids once the (arduous) selection was finished and the treats paid for? Head on over to DeloiciousBaby for more travel-themed Friday photo fun. This entry was posted in Kid Travel Photos and tagged Ecuador, Photo Friday, Puerto Lopez on September 30, 2010 by wandermom. I was just watching the Seattle news and saw they were following breaking news out of Ecuador being in a state of emergency. My boyfriend actually looked at me and said “I hope that ladie’s family is okay!” I hope everything is going good over there! we LOVE all the pics and stories! Look at all the selection he had! I would be happy too. The glass box is a clever idea. I love the entrepreneurial skills of those in the developing world! I love street foods. They are cheap and really very delicious. 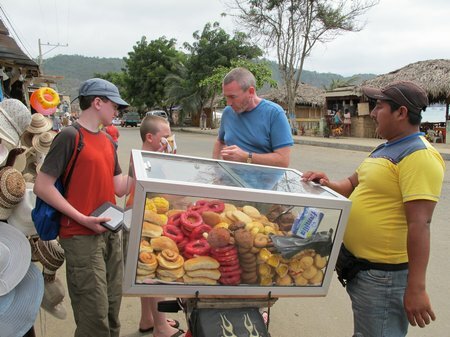 I am so amazed on how the man market those pastries. He is actually on a motor cycle that is so amazing. For me he is a running bakery shop with all the selections of pastries he offers.